A new book on open-source geospatial information systems (GIS) will be published in May. 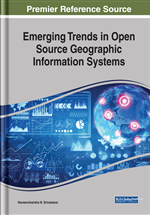 Information on the book is available on Emerging Trends in Open Source Geographic Information Systems, by Naveenchandra N. Srivastava of the Bhaskaracharya Institute for Space Applications and Geo-Informatics, India. Open access to information of geographic places and spatial relationships provides an essential part of the analytical processing of spatial data. Access to connected geospatial programs allows for improvement in teaching and understanding science, technology, engineering and mathematics. Emerging Trends in Open Source Geographic Information Systems provides emerging research on the applications of free and open software in GIS in various fields of study. While highlighting topics such as data warehousing, hydrological modeling and software packages, the book explores the assessment and techniques of open software functionality and interfaces. It will serve as a resource for professionals, researchers, academicians, and students seeking current research on the different types and uses of data and data analysis in GIS.